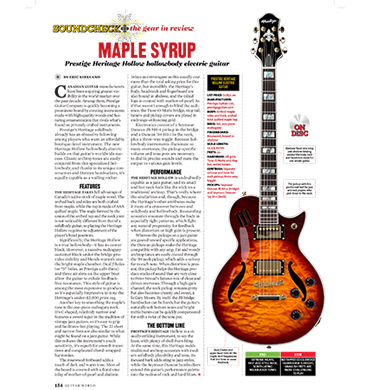 Heritage Hollow Review in Guitar World Magazine - Prestige Guitars Ltd.
the past decade. Among them, Prestige Guitar Company is quickly becoming a prominent brand by creating instruments made with high-quality woods and featuring ornamentation that rivals what’s found on privately crafted instruments. Prestige’s Heritage solidbody already has an obsessive following among players who want an affordable boutique-level instrument. The new Heritage Hollow hollowbody electric builds on that guitar’s worldwide success. Classic archtop tones are easily conjured from this specialized hollowbody, and thanks to its unique construction and Duncan humbuckers, it’s equally capable as a wailing rocker. THE HERITAGE TAKES full advantage of Canada’s native stock of maple wood. The arched back and sides are both crafted from maple, while the top is made of AAA quilted maple. The angle formed by the union of the arched top and the neck joint is not noticeably different from that of a solidbody guitar, so playing the Heritage Hollow requires no adjustment of the player’s hand positions. Significantly, the Heritage Hollow is a true hollowbody—it has no center block. However, a massive mahogany sustainer block under the bridge provides stability and blends warmth into the bright maple chamber. Dual f-holes (or “S” holes, as Prestige calls them) and three air slots on the upper bout allow the guitar to exhale feedbackfree resonance. This style of guitar is among the most expensive to produce, so it’s especially impressive to note the Heritage’s under-$2,000 price tag. Another key to smoothing the maple’s tone is the one-piece mahogany neck. It’s C shaped, relatively narrow and features a sword taper in the tradition of vintage jazz guitars, so it’s easy to grip and facilitates fast playing. The 22 short and narrow frets are also similar to what might be found on a jazz guitar. While this reduces the instrument’s touch sensitivity, it’s superb for smooth transitions and complicated chord-wrapped harmonies. The rosewood fretboard adds a touch of dark and warm tone. Most of the board is covered with a floral vine inlay of mother-of-pearl and abalone. Inlays as extravagant as this usually cost more than the total asking price for this guitar, but incredibly, the Heritage’s body, headstock and fingerboard are also bound in abalone, and the inlaid logo is created with mother-of-pearl. As if that weren’t enough to blind the audience, the Tune-O-Matic bridge, stop tail, tuners and pickup covers are plated in midrange-enhancing gold. Electronics consist of a Seymour Duncan JB SH-4 pickup in the bridge and a Duncan ’59 SH-1 in the neck, plus a three-way toggle. Because hollowbody instruments illuminate so many overtones, the pickup-specific volume and tone pots are necessary to dial in precise sounds and mate the output to various gain levels. it more of a crossover between and solidbody and hollowbody. Resounding acoustics emanate through the body in especially tight patterns, which fight any natural propensity for feedback when distortion or high gain is present. Whereas the pickups on a jazz guitar are geared toward specific applications, the Duncan pickups make the Heritage compatible with any amp. Fat and woody archtop tones are easily coaxed through the ’59 neck pickup, which adds a velvety fur to each note. When distortion is present, this pickup helps the Heritage produce stacks of sound that are very close to Peter Stroud’s famous mix of clean and driven overtones. Through a high-gain channel, the neck pickup remains gritty but also becomes creamy and sweet, a’la Gary Moore. By itself, the JB bridge humbucker can be harsh, but the guitar’s naturally soft bottom notes and bright treble bursts can be quickly compensated for with a twist of the tone pot. PRESTIGE’S HERITAGE Hollow is a visually striking instrument, to say the least, with plenty of shell-born bling. At the same time, this Heritage melds traditional archtop acoustics with modern solidbody playability and tone. Its focused bark adds sting to jazz styles, while the Seymour Duncan humbuckers extend this guitar’s performance palette into the realms of rock and hard blues.